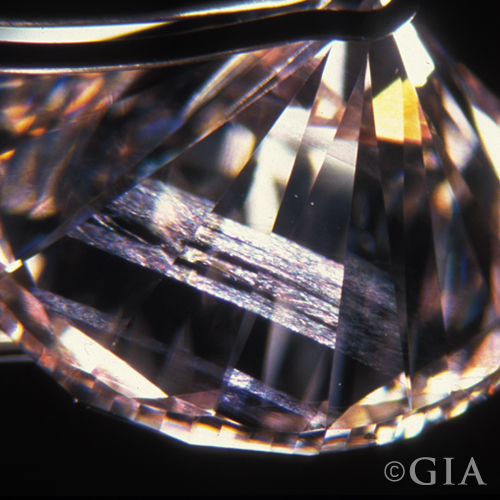 When diamonds are formed deep in the earth, they develop natural birthmarks – slight irregularities and features which are visible to a skilled grader under 10x magnification. These are collectively known as “clarity characteristics” or ‘“inclusions”. 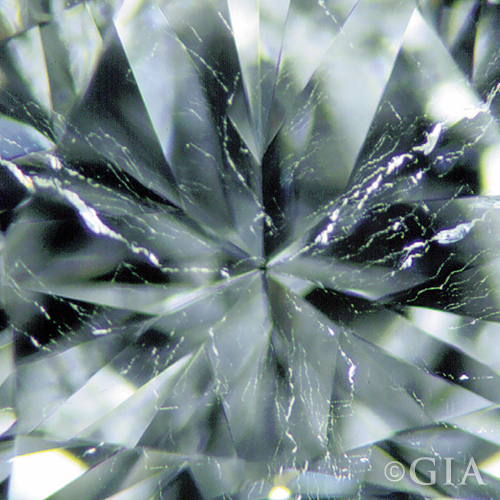 Not only do these allow graders to differentiate between synthetic and natural diamonds, but also allows the quality of a diamond to be determined. Depending on the size, quantity, placement, tone or colour of these clarity characteristics, they may or may not be visible to the naked eye. This is one of the reasons why a truly flawless diamond is so rare. 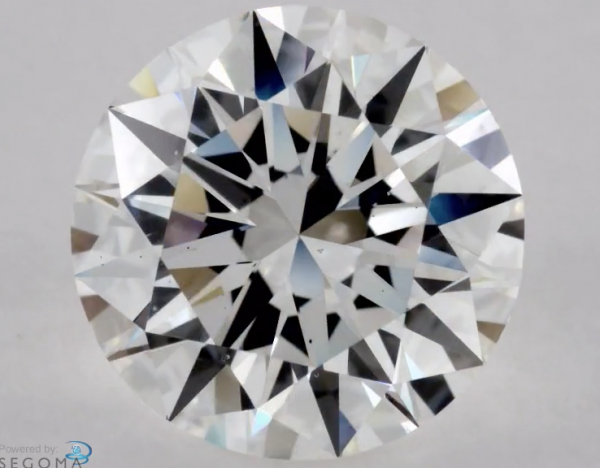 We will explore the different types of inclusions and how they affect the appearance of the diamond so you can identify and further understand how these inclusions will visually impact a diamond’s appearance. 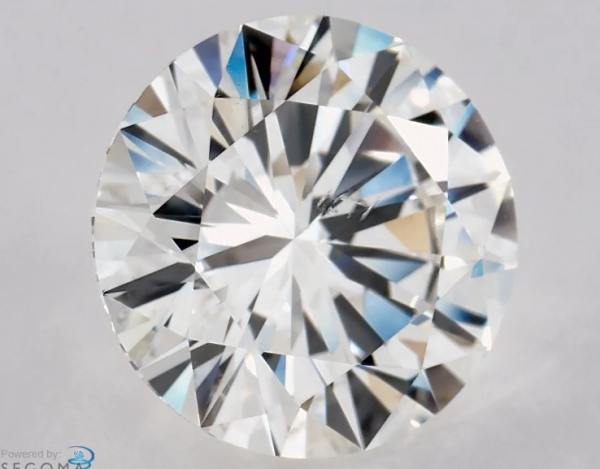 What type of diamond inclusions are there? Hair-like lines that often occur during the cutting of a diamond and extend from the girdle into the surface of the stone. If a girdle is heavily bearded, its appearance will look a grey and fuzzy fringe, almost as if it has been scratched. 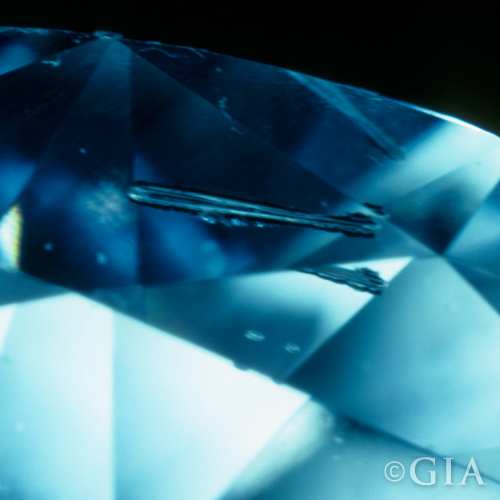 A cavity inclusion is a large or deep opening in the diamond’s surface. 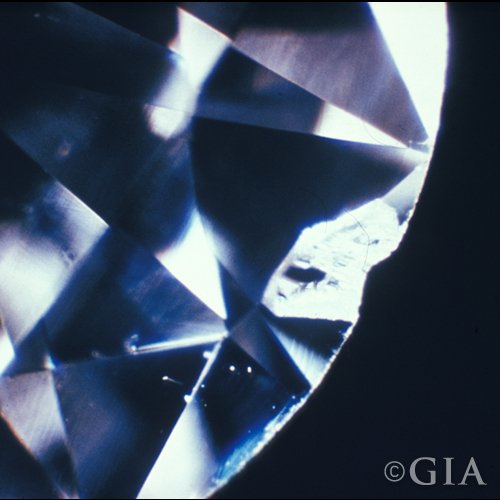 In most cases, cavities are created during the polishing process when an internal inclusion is breached or gets dislodged from the diamond, leaving an opening on the diamond’s surface. They tend to trap dirt and oil which soon turns dark and more visible. The most frequently asked question around cavity inclusions is ‘why didn’t the cutter polish off the cavity?’. The answer generally boils down to economics. To completely remove a cavity inclusion would result in a weight loss to the diamond. Most cutters opt to retain a higher weight at the expense of a lower clarity grade since the value of a heavier diamond is usually higher. 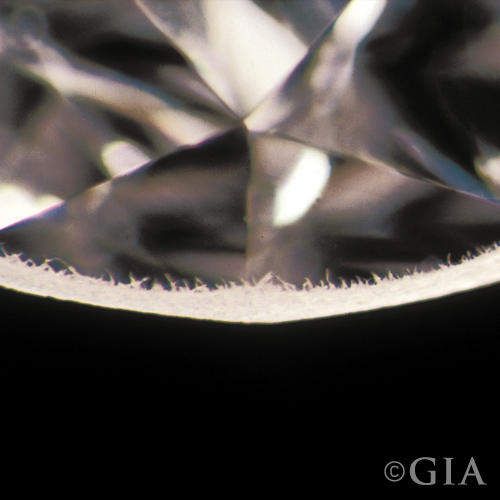 A small, shallow opening on the surface of a diamond often found near the girdle, culet or facet junctions. This inclusion is typically man-made in the sense that it is damage caused by wear and tear or accidental knocks. A cloud inclusion is a very broad term used to classify a cluster of pinpoints/crystals found very close to each other. 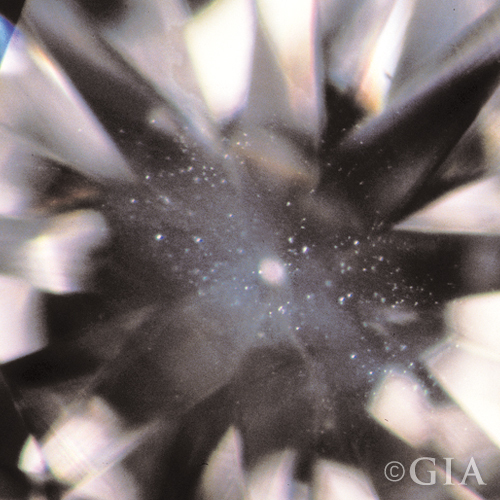 Depending on the nature of the cloud inclusion, it can sometimes pose an issue to the diamond’s appearance. For example, when clouds get too big in size and density, they can cause the diamond to take up a hazy appearance and negatively affect its light transmission properties. If they are small and diffused, it generally isn’t a cause for concern. 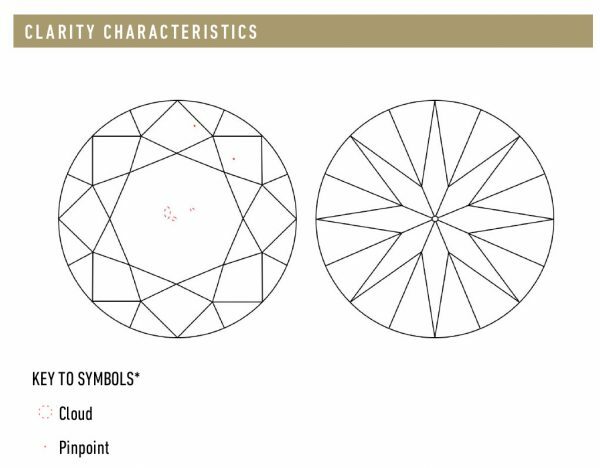 If your chosen diamond is over one carat in weight, your GIA report will include a plot diagram (shown below) that details the clarity characteristics of the diamond. A crystal inclusion is quite literally a mineral crystal that is contained within the diamond. Depending on the type of minerals they are, they can be colourless (this is when another diamond is embedded within the diamond), black (carbon), reddish (garnets), greenish (peridots) etc. Since coloured crystal inclusions are much more obvious to the naked eye, they are generally undesirable. A small crack or fracture within the diamond. 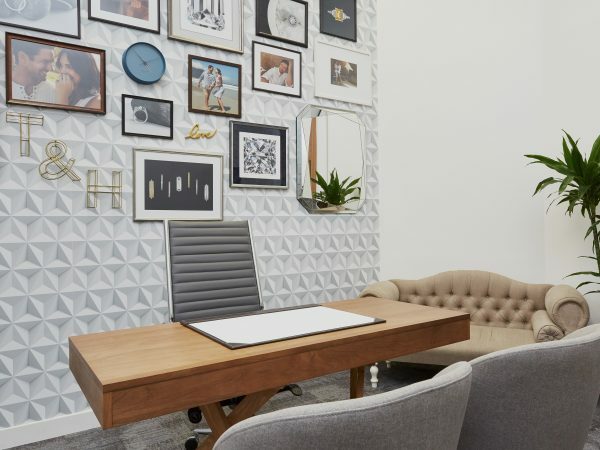 Depending on your viewing angle, a feather inclusion can look transparent and almost invisible or it can catch on light and display a whitish feather-like appearance. Severe feathers can cause durability issues, especially if they reach the surface, are near the girdle, or have unsightly colouration to them; both of which should be avoided. Caused by irregular crystal growth, internal graining may appear milky or hazy, like faint lines or streaks. Depending on their severity, they can also appear like creases or reflections. 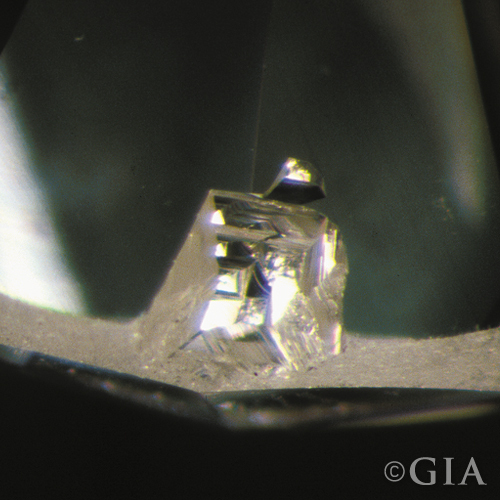 An area of the rough diamond’s surface which dips below the polished diamond’s surface. An indented natural is a part of the rough diamond that was left untouched during the polishing process and is usually found at the girdle. 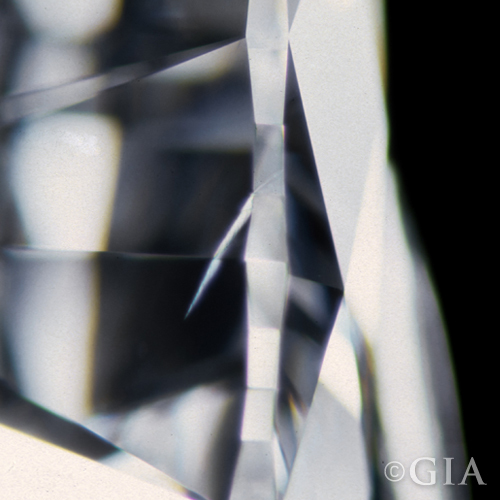 A white or transparent crystal which reaches the surface of a polished diamond. Knot inclusions sometimes resemble raised areas on a facet surface or group of facets. A long thin needle-shaped inclusion that is usually white or transparent in colour and visible at 10x magnification. 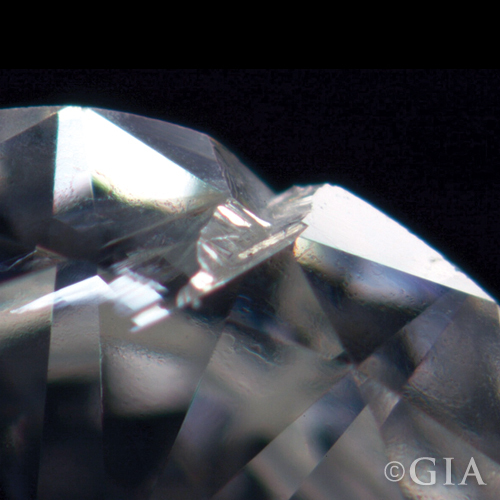 If they appear in clusters, it might have a detrimental effect on the diamond’s clarity. 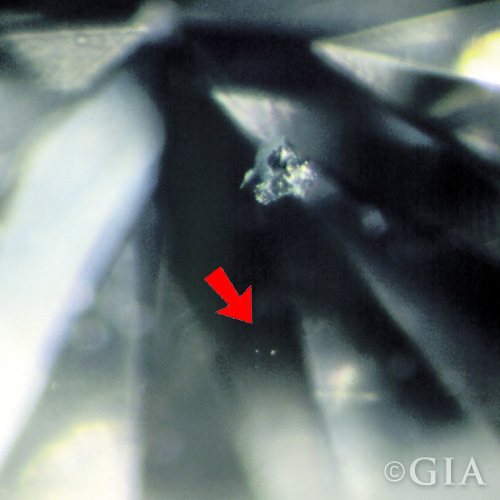 These are very small white or black crystals that are embedded inside a diamond. These internal crystals look like a small dot, visible at 10x magnification. 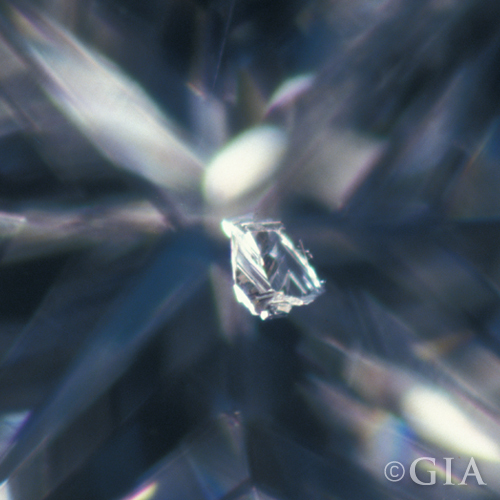 This inclusion is a series of pinpoints, clouds, or crystals that form while a diamond is growing. 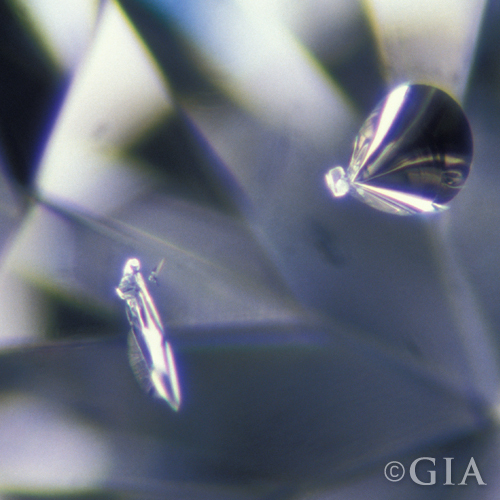 During a diamond’s formation process, it may stop growing due to unfavourable conditions and twinning wisps are formed when growth restarts in a different direction, sometimes thousands of years later. Twinning wisps are essentially a mish-mash of different inclusions such as pinpoints, crystals, feathers and clouds, that form a chaotic pattern. 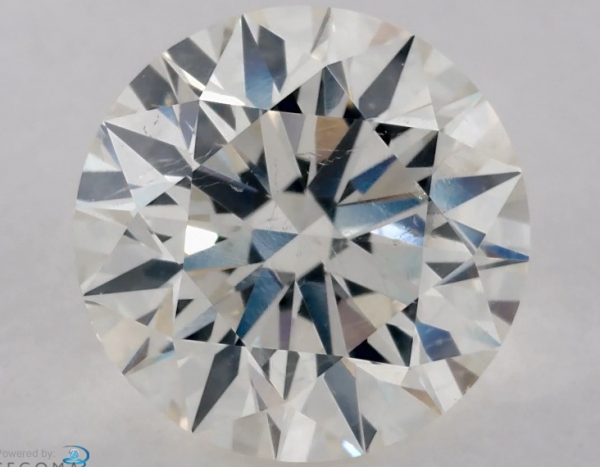 So this concludes the list of common inclusions found in a diamond that will affect its overall clarity grade. Each of our diamonds are inspected by our diamond buying team to ensure they meet our stringent quality requirements. If you have any questions regarding diamond inclusions, feel free to contact us and our diamond experts can answer any of your queries.